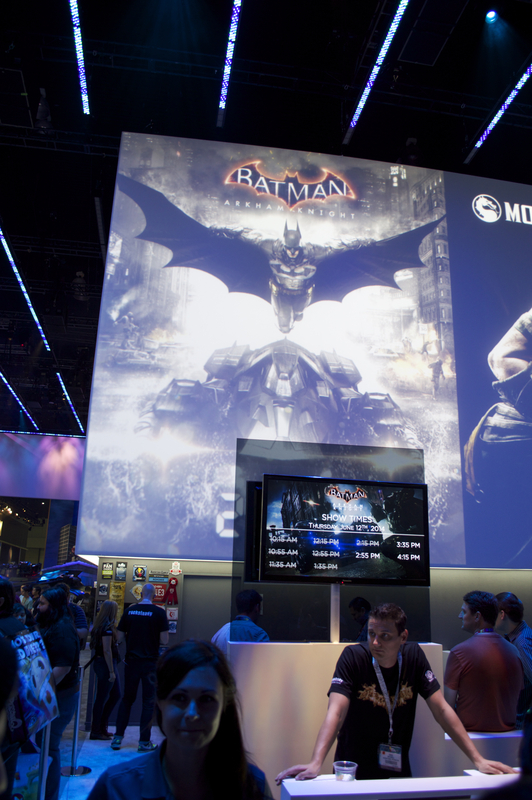 At E3, Warner Brothers’ booth was an impressive one. A towering structure housed theaters that showed screenings of their newest, upcoming titles. Upon entering into this grandiose building-within-a-building, we were treated to a play-by-play of some new gameplay sequences for Batman: Arkham Knight. First up, new movement options were demoed. The most impressive of these was the continuous grappling hook maneuver. This allowed for pretty extreme and fluid movement while traversing up the sides of buildings. It was quite impressive and a welcome addition to the already (in my opinion) sublime character controls and navigation aspects of the previous games. What followed was both impressive and not so impressive at the same time. With the batmobile, you’ll be able to really have some serious advantages in certain set pieces built for it throughout the single player experience. In other moments, you’ll be able to switch modes and the vehicle becomes extremely nimble, able to use a cannon and move side-to-side like the old bullet hell arcade shooters of years gone by. While visually and aesthetically a treat, this extra-nimble and badass multi-mode batmobile just sorta felt like cheating. The damned thing is just incredibly arcadey and really inspired a sense of overwhelming advantage; I would feel like a god among men if I had it at my beck and call, with barely the slightest sense of mortality. Batman does have his gadgets, yes, but he is still mortal. Here’s hoping that Batman: Arkham Knight is a little more challenging than it looked at E3. It’s a gorgeous, fluid action/adventure/brawler, but it feels like with each Batman title we’re losing more and more of his mortality and we’re instead being forced to accept that Mr. Wayne is an unstoppable God-like balls-to-the-wall techno force to be reckoned with. The beauty of the Batman franchise (and any superhero franchise, really) is when we see him overcome vulnerabilities that are typically exploited by the worst sort of villains there are. And the different villains represent varying aspects of the most horrifying things that ruin the world we live in. Conquering those vulnerabilities and confronting those fears is what ultimately enables us to become better people, leading to the beginnings of a better society. If I’m skidding around in a bat-tank-mobile picking off enemies like it’s an arcade shooter from the 90s, then I feel like I’m playing a game wherein the writers felt the narrative was too boring to carry itself and needed a lil’ bit o’ pandering to the twitch action lovers who will undoubtedly be a part of their target audience. Don’t get me wrong, the game looked wonderful, yet that impression only went skin deep.